Angela Peavy and Royal Dark Chocolate. Photo Credit: ©SusanJStickle. Wellington, FL – March 11, 2017 – Week nine of the 2017 Adequan® Global Dressage Festival (AGDF) features CPEDI 1*/2*/3* Para Dressage, presented by Mane Stream courtesy of Rowan O’Riley, Mission Control, Adequan®, and Nutrena. 2016 Paralympian Angela Peavy (USA) and Royal Dark Chocolate, a 2008 Oldenburg mare owned by Rebecca Reno, were once again victorious in the Para Team Test Grade IV – CPEDI 3*, with a score of 71.057%. The score was the second highest of the day’s competition. Peavy has only been working with Royal Dark Chocolate, also known as “Cocoa”, for a little over a month. Peavy also commented on the future with her new mount. “Hopefully we make the team for the World Equestrian Games. I would also like to take her to Europe this summer, which is something we are still talking about. I’m going to show her here in the national shows in the next couple of weeks,” she said. Placing second to Peavy in the Para Individual Test Grade IV – CPEDI 3* was Pamela Hardin (USA) and Quarterjack, a 2005 Brandenburg gelding (Quaterman x Medea ii x Rohdiamant) owned by Hardin, with a score of 67.589%. Third place was awarded to Laura Hall (CAN) and Boo Sinclair, a 2006 KWPN gelding (Sir Sinclair x Onward O’Crimson) owned by Dr. Heather Boo, with a 65.203%. Other classes of the day included the Para Individual Test Grade I – CPEDI 3*, which awarded a win to Jody Schloss (CAN) and Lieutenant Lobin, a 2004 Danish Warmblood gelding (Lobster x Farine) owned by Schloss, with a 71.250%. The Para Individual Test Grade II – CPEDI 3* was won by Laurietta Oakleaf (USA) and Niekele Fan Busenitz, a 2004 Friesian stallion (Sape 381 x Wemke H x Fetse 349) owned by Oakleaf, with a 70.784%. Charlotte Merle-Smith (USA) and Firewalker, a 2006 Westfalen gelding owned by Merle-Smith, took the winning ride in the Para Individual Test Grade III – CPEDI 3*, scoring 64.255%. Katie Jackson (USA) and Royal Dancer, a 2005 Westphalian gelding owned by Kai Handt, captured a win in the Para Individual Test Grade V – CPEDI 3* with a score of 69.921%. 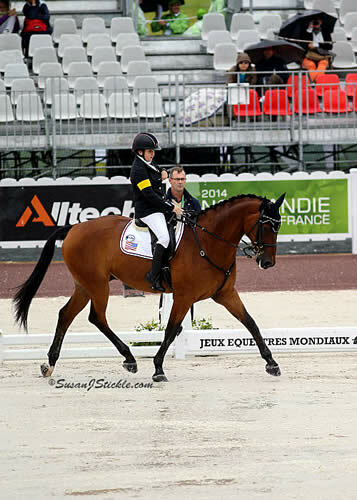 Caen, France – Nations took the next steps in earning Para-Dressage Team medals, as riders also had their first opportunity to claim Individual medals at the 2014 Alltech FEI World Equestrian Games on Wednesday at the La Prairie Racecourse. Grade III and 1b combinations went to task throughout the day, as the U.S. was represented by Angela Peavy and Sydney Collier. In the Grade III Championship, Peavy (Avon, Conn.), competing as an Individual, closed out her first World Championship experience in the Individual Test on Rebecca Reno’s Ozzy Cooper. In their second test of the World Games, the combination earned a score of 63.561% from the Ground Jury of Alison King, Eva Bachinger, Kjell Myhre, Hanneke Gerritsen, and Marco Orsini. The pair finished the Grade III Team Test in 17th place. Germany’s Hannelore Brenner and Women of the World earned the Gold medal in the Grade III Individual Test on a score of 73.610%, with The Netherlands’ Sanne Voets and Vedet PB N.O.P. claiming the Silver medal on a score of 72.053%, and Annika Lykke Risum and Aros A Fenris of Denmark earning the Bronze medal with a score of 69.868%. Collier (Ann Arbor, Mich.) and Victoria Dugan’s Willi Wesley had a marked improvement in the Grade 1b Individual Test over their Team Test on Monday. The combination earned a score of 68.103% from the Ground Jury of Sarah Leitch, Anne Prain, Hanneke Gerritsen, Eva Bachinger, and Freddy Leyman. The 16-year-old was hoping to build on her performance from Monday and earn a finish within the top 12 in the Individual Test. They were able to do just that as she notched a ninth-place finish on Wednesday. The winners of the Grade 1b Individual Test Gold medal were Lee Pearson and Zion of Great Britain on a score of 77.310%. Pepo Puch and Fine Feeling S of Austria claimed the Silver medal on a score of 76.520%, with Silvia Veratti and Zadok of Italy earning a score of 72.00% and the Bronze medal. Angela Peavy finished tenth with Ozzy Cooper in the Grade III team test on a score of 65.421 percent. CREDIT: SusanJStickle.com. CAEN, NORMANDY, August 25, 2014 – The USA got off to a strong start in day 1 of para-equestrian dressage competition at the 2014 Alltech FEI World Equestrian Games™. 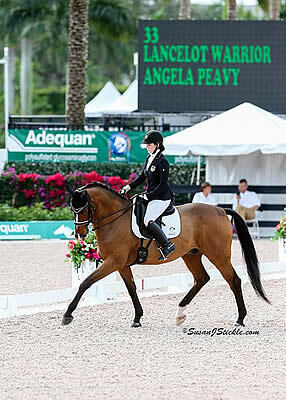 First up was individual competitor Angela Peavy, 18, of Avon, Conn., who earned a tenth-place finish in the Grade III team test on a score of 65.421 percent. Peavy’s mount for the Games is Ozzy Cooper, an eight-year-old Trakehner gelding (Hibiskus x Arrak) owned by Rebecca Reno. This WEG is Peavy’s first international competition, as it is likewise for her teammate Sydney Collier, 16, of Ann Arbor, Mich. Collier’s story – she is the youngest para-dressage competitor at these Games, and the International Equestrian Federation (FEI) fact-checkers are busy trying to confirm their hunch that she may be the youngest competitor in all of the disciplines at this event – has charmed the media, as have Collier’s accounts of her service dog, a white Poodle named (appropriately) Journey, who is the first dog to receive a proper WEG accreditation, credential and all. Aboard Willi Wesley, a fourteen-year-old Hessen gelding (Wolkenstein x Kokoschka) owned by Victoria Dugan, Collier earned a score of 65.960 percent in the Grade Ib team test, which put her in thirteenth place. “It was an incredible experience to be riding with such amazing other riders,” Collier said afterward. “For my first time, my horse was super-well-behaved, and thankfully I don’t get nervous, because of my stroke,” she said, referring to the incident that changed her life at age 11. WEG para-equestrian team dressage competition continues tomorrow, August 26. 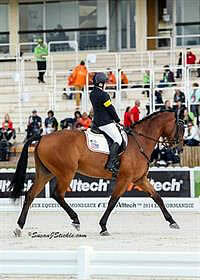 First up for Team USA will be 2010 WEG athlete Susan Treabess, who will ride Kamiakin in the Grade IV team test. Reigning six-time USEF Para-Equestrian Dressage National Champion, two-time Paralympian (2008 and 2012) and 2010 WEG athlete Rebecca Hart will contest the Grade II team test aboard her new mount, Schroeter’s Romani. And Roxanne Trunnell will ride Nice Touch in the Grade Ia team test.